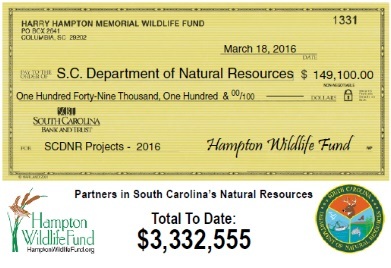 The Harry Hampton Memorial Wildlife Fund has presented the S.C. Department of Natural Resources with a check for $149,100 to be used for statewide conservation projects during 2016. The presentation was made in Columbia Friday, March 18 during a meeting of the S.C. Natural Resources Board, the policy-making body of the S.C. Department of Natural Resources (DNR). The total donated to DNR by the Hampton Wildlife Fund over the years now stands at $3,332,555. The Harry Hampton Memorial Wildlife Fund is a private, non‐profit corporation that partners with DNR for the promotion of natural resources and natural resource education, which benefits the conservation of wildlife, marine and other resources in South Carolina. Funds are obtained solely through private donations and special promotional projects and fund-raising events. Although some of the funds are donated to special projects run by the DNR, they are not used to replace any of the department's programs already supported by state appropriated money. "The mission of the Hampton Wildlife Fund is to support DNR in its role as stewards of this state's vast natural resources," said Dr. Julius L. Leary of Greenwood, Hampton Wildlife Fund board chairman. "We thank the many who so generously support our fund-raising efforts, allowing us to help fund DNR's great work in the Palmetto State," said Jim Goller of Beaufort, Hampton Wildlife Fund executive director and a DNR retiree. Public education about wildlife and marine resources management and conservation is a major thrust of the fund's purpose. Scholarships are annually awarded to South Carolina resident students to attend a Palmetto State institution of higher learning majoring in wildlife, fisheries, forestry, biology, zoology, marine science, environmental science or related fields. One scholarship is awarded annually in the field of law enforcement/criminal justice, and another is awarded in the field of journalism. Find out more about the Harry Hampton Memorial Wildlife Fund by visiting www.hamptonwildlifefund.org or visit on Facebook at www.facebook.com/harryhamptonfund/.